Dr Eddy Dona is a member of the Australian Society of Plastic Surgeons and one of the most in demand Plastic Surgeons in Australia. From your first clinic visit, and after seeing some of the exceptional results achieved, you’ll understand why. As a youngster at school, Eddy considered two possible career options….one was an artist, the other was a doctor. His love of art was reflected in his HSC subject choice of 3 unit art, where his major art works topped the state and were part of the annual Art Express Exhibition (best of the HSC). However, a career in medicine beckoned, and after finishing his degree in medicine at the University of Sydney, he pursued a surgical career. 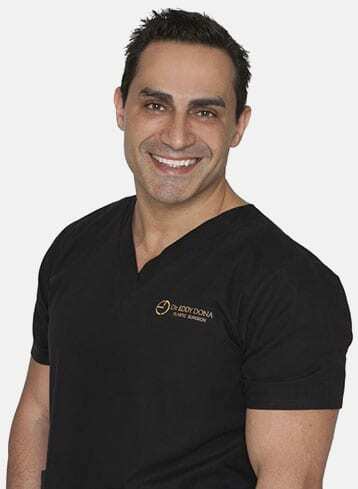 Of all the surgical specialties available, the one that he knew he was made for was Plastic Surgery, which Dr Dona believed to be a perfect fusion of art and surgery, and where he could express his true artistic flare. After a further 11 years of intense training Dr Dona became a fully qualified Cosmetic, Plastic & Reconstructive Surgeon. Of course, plastic surgery is far more than cosmetic surgery, with a large part of the training and practice dedicated to reconstructive work. Indeed, despite the demands on his time, Dr Eddy Dona still commits part of his time to working in some of Sydney’s busiest public hospitals, including providing emergency on-call services. It is here where Dr Dona is often required to reconstruct the bodies of those affected by trauma and cancer. He firmly believes that only through the experience and skills of “restoring” a person’s normal form is a surgeon able to comprehend what it is to be a true cosmetic plastic surgeon. “Enhancing someone’s natural beauty is easy for the surgeon who is also capable of recreating beauty that has been stolen” Dr Dona says. Ensuring he stays abreast of the most advanced techniques, Sydney plastic surgeon Dr Eddy Dona regularly attends national and international conferences in Cosmetic Surgery. A comprehensive understanding of human aesthetics, a true artistic flare and a commitment to nothing less than exceptional, ensures Dr Dona’s patients are always in good hands. Superior care demands a superior setting…..our state-of-the-art plastic surgery clinic in the Sydney suburb of Bella Vista was custom designed with patient comfort and style in mind. We focus on you, and always aim to provide the finest personal service and facilities so that you will always enjoy a warm, relaxed, yet refined ambiance. Our personalised care begins with your first contact to our clinic through to your consultation where we will discuss available options, anticipated results, and recommended procedures. After an examination and evaluation, you’ll receive personalised recommendations tailored to your cosmetic enhancement needs. This individualised approach ensures you are knowledgeable, comfortable and confident with your personal medical decisions and that your goals are achieved! Quite simply, our philosophy is to treat our patients like we would our family and be the very best in what we do…Cosmetic Plastic Surgery. Ultimately, we want you to be an exceptional WORKofART! Suite 413, 29 – 31 Lexington Drive, Bella Vista. Approximately 60 minutes from Sydney Airport. Do I need a referral to see Dr Dona? Some procedures do attract a rebate from Medicare and/or your health fund which require a GP referral to be present at your initial consult. Please contact our clinic 1300 373 662 to confirm if you require a referral. How much does a personal consultation with Dr Dona cost? $300 – at the time of making your appointment full payment is required. We require a minimum of 2 weeks’ notice if you wish to cancel or reschedule your appointment otherwise a penalty may apply. How long does the consultation go for? Can I discuss multiple procedures? Consultations with Dr Eddy Dona go for approximately 30 minutes. If you wish to discuss more than one procedure please notify the clinic when booking your appointment so we can allocate enough time. Is Dr Dona a member of Australian Society of Plastic Surgeons? Once you make the personal decision to get cosmetic surgery, your first essential step is choosing a qualified surgeon. In contrast, a plastic surgeon is a doctor who has undergone some 8 – 12 years of additional extensive supervised specialist qualifications, the doctor then must pass comprehensive written and oral exams. Only after successfully completing such rigorous training does one achieve Royal Australasian College of Surgeons and government recognised “Plastic & Reconstructive Surgery” qualifications. To schedule a consultation please contact the clinic 1300 373 662. At peak times Dr Dona can be booked 3 months in advanced. If you can be seen at short notice please ask to be placed on our wait list. There is ample off-site parking available however can become very busy during peak times. We recommend to allow enough time to find parking. Who is a good candidate for plastic surgery? Anyone who is both physically and mentally healthy, who has a realistic expectation as to the outcome of the procedure can be a good candidate. Dr Eddy Dona has operating privileges at a number of fully accredited hospitals or day surgery facilities where your surgery will be performed. It is important to understand that operating time is extremely valuable and highly sought after. If you need to cancel your surgery it is essential you do so in writing and as soon as possible. A minimum notice of 4 weeks’ prior to your scheduled date of surgery needs to be provided to our office, as the closer to your procedure you cancel, the more difficult it is to offer this reserved space to another person. Not rescheduling and/or providing less than 4 weeks’ notice to our office a penalty may apply. No, whether your surgery requires sedation or a full general anaesthetic, the patient will need someone to drive them home and stay with them for at least 24 hours after the procedure. There is an increased risk of developing blood clots (deep vein thrombosis) in the weeks following surgery. Deep vein thrombosis (DVT) can be a potentially life threatening condition. Due to this increased risk we advise you to avoid any lengthy flights in the first month following surgery. If you do resume flying we suggest the use of compression stockings, in-flight exercises and drinking plenty of water. After 2 weeks following your surgery, you may also use aspirin, as directed, before a flight to reduce the risk of blood clots.